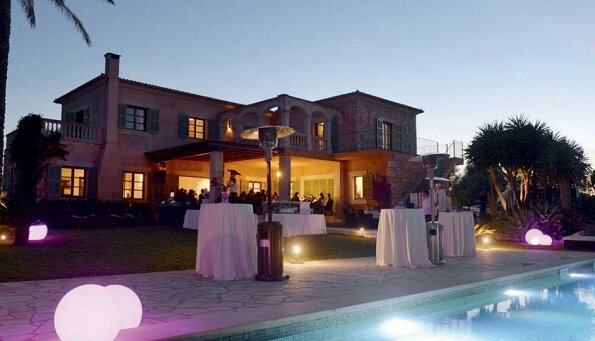 Prince Louis of Luxembourg and Princess Tessy of Luxembourg attended a summer party held by Bunte Die Culture and Travel Club at a luxury villa in Palma de Mallorca, the holiday island of Spain. I like them! Striking couple! Prince Louis looks unrecognizable with his moustaches. About Tessy, combination looks just tired. There in mallorca is now very hot, those shoes are ugly and she must have had them very hot. Dress is not any good color to her either. Well it shows her beautiful figure! Let's hope it is a dress that moves beautifully because it cuts in all the right places. Chunky shoes cannot make a comeback...yet they persist! wow, he now looks about 20 years older than her. Tessy has become a great asset for the Grand Ducal Family, they are lucky to have her. I think the gown she is wearing is lovely.